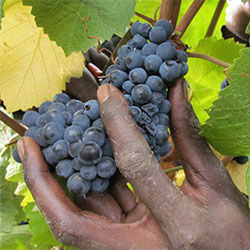 Bahi district Agricultural Officer Mr. Jovin Bararata said to Citizen newspaper recently that the winery at Lamaiti in Bahi District in the Dodoma region in central Tanzania will start selling millions of litres of grape juice to Kenyan and South African wine companies this year. Mr. Bararata mentioned that vast markets had been secured in the two countries. Production of grapes in the Dodoma region has been possible with establishment of a winery at Lamaiti in Bahi District with the support from TIB Bank and UTT Microfinance Bank. Loans of about TZS 1.3 billion and TZS 0.3 billion have been granted by TIB and the UTT respectively. CRDB Bank also financially supported the farmers in the first phase to grow more than 300 hectares of grapes, said Chamwino district Agricultural Officer Mr. Godfrey. Dodoma is the prominent wine region in Tanzania where major wine producers such as Tanzania Distillers Ltd, Dodoma Wine Company (DOWICO), and the National Milling Corporation (NMC) are present.